Use Art Glass, Luminous Elements and Liquid Glass fixative to design your own dichroic glass look-alikes! It's fast, easy, fun and economical! 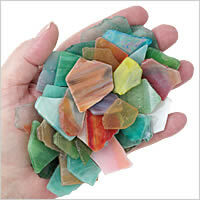 Choose from six colors of art glass. Pieces are freeform to allow design creativity. Add, combine or mix snips of Luminous Elements sheets on to the top of the art glass. 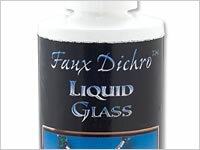 Apply several thin coats of Liquid Glass to the surface for a glass-like finish. 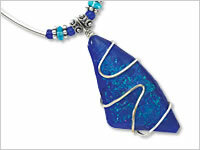 Allow to dry and style into popular wire-wrapped or set jewelry.